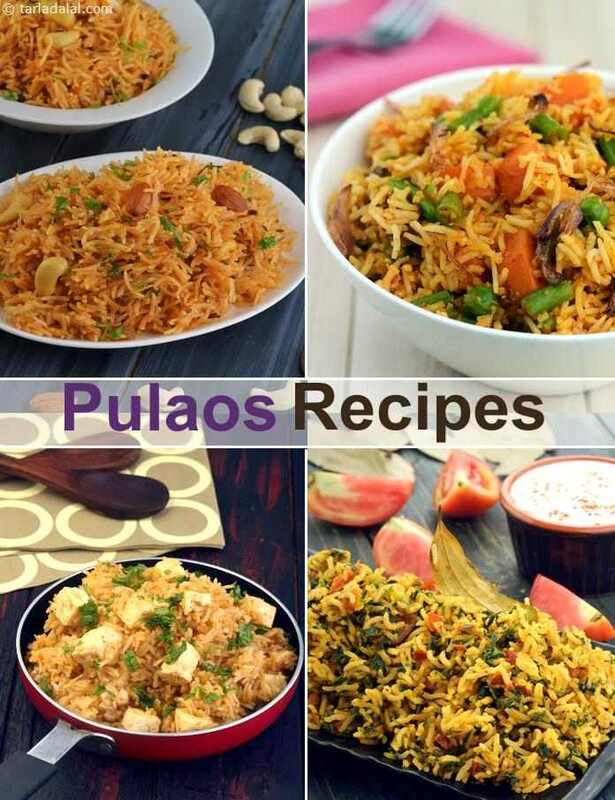 210 Pulao recipes, Veg Pulao, Pulav Recipes, How to make Pulao ? Pulao is a rice preparation that combines rice with an aesthetic blend of spices, and other ingredients like veggies, Sprouts, Paneer, Dry fruits, nuts, etc. In this busy era, when people hardly have time to cook, pulao is a brilliant choice, because it can be eaten as a one-dish meal or served with simple accompaniments depending on the spice level of the recipe. Moreover, pulao is something that’s loved by everyone, young and old, so you can make just one dish to please the whole family! Who can resist the charm of evergreen delights like Veg Pulao, Green Peas Pulao, Jeera Pulao or the pleasantly sweet Kashmiri Pulao? Pulao is always made with whole grains of rice, either white or brown. The long grains of Basmati are just perfect to make attractive and tasty pulaos. Health-conscious people these days opt to make their pulaos with fibre-rich brown rice, which is a good decision too. Apart from rice and spices, your pulao can include an endless number of other ingredients, not just vegetables. You can toss in some greens like Spinach (Palak) or Fenugreek (Methi), herbs like Mint or Coriander, sprouts or beans, paneer, Tofu or even koftas! The ingredients used also contribute their flavour to the pulao. For example, if you have added Capsicum or fenugreek leaves to your pulao, you are sure to experience the unique flavours of these ingredients in every mouthful! Different combinations of ingredients give the pulao a different look and feel – so, there is no end to the variety of pulaos that are there. If you are bored of the standard ones, you can mix-and-match ingredients and make your own special pulao. A pressure cooker will help you make the pulao really fast and easily too. Just temper the spices, add the soaked rice, toss in all the other ingredients and cook to perfection. You just need to be careful about the amount of water you add, and the duration of time for which you cook, because you want a pulao with perfectly-cooked grains of rice, not a glorious khichdi! While the pulao is usually made in a pressure cooker, a biryani is cooked in a handi. It is amazing how the utensil used changes the flavour of the food! These unusual pulaos are especially handy when guests come over. They are easy to make but appear special! You can make a couple of starters, prepare a unique pulao and serve it with a few peppy accompaniments. Your guests will thoroughly enjoy the meal! You have to choose your accompaniments depending on the spice-level of your pulao. If your pulao is bland, serve it with kadhi, else a simple raita or just a cup of curds will do. Papads are a must, to add an element of crunch to the tasty meal! Go ahead and try the below recipes. You can prepare them without any fuss even after a busy and tiring day. Armed with our tips, you are sure to get them all right, and your loved ones will relish every bit of the meal! Hara bhara subz pulao, it gets its name from delicately flavoured green paste. Pressure cooking allows the absorption of intricate flavours of the paste, resulting in a uniformly charming taste throughout the dish. Paneer pulao, neatly cut cubes of paneer, sautéed to golden brown colour and cooked with rice and spices. Rajma curry. The paneer cubes do not break even if pressure cooked hence venture to make this dish without any fear. Paneer is a show-stealer! undoubtedly one of my favourites. Layers of rice and spicy paneer mutter make this biryani a real delicacy. Definitely worth a try ! This festive season surprise your loved ones with this exotic Paneer Tikka Pulao. The juicy paneer and vegetables are marinated in a dense blend of curd and spices, before being cooked on a tava, and finally tossed in with the rice to make a finger-licking delicacy.